Ta this page for Sui Southern Gas Company SSGC Jobs 2019 in Pakistan Apply Online Last Date. 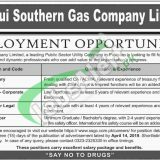 The well-known Govt sector named SSGC - Sui Southern Gas Company which is engaged and working in the distribution, sales and transmission of Gas in Sindh & Balochistan is recently looking to appoint the caliber and adroit individuals in Pakistan for the services of high profile, capable and brilliant applicants which are required to fill the following vacancies. SSGC Jobs are such as (Manager Treasury (JC 8025-02), Manager Legal - Corporate (JC 8026-01), Deputy Manager Legal (JC 8027-02), Fire Safety Officer (JC 8028-01)) are the vacant situations based at Balochistan, Sindh, Karachi which need to be filled right now. Those applicants who belong to province Sindh and Balochistan so for them its the better opportunity to apply in this sector because this sector offers excellent remuneration packages and other fringe benefits to the applicants will be given to the applicants. So guys, get up and rush towards these senior positions in order to get employed and to also get rid of unemployment too. Now, let's have a discussion below about its educational and experience details as well as its applying criteria. Educational & Experience Requirements for SSGC Jobs: As education is the main and basic tool for applying any sort of job similarly the overall qualification for these posts includes CA / ACMA / LLB / Bachelors in the relevant discipline from HEC recognized institutes and along with working in the oil and gas sector and each and every working experience for several years formerly is required for each post with capability of handling each job work meticulously. Age Limit: Applicants possess age from 32 to 38 years. The last date for applying is April 14, 2019. Both male and female are eligible to apply. Late received and those of incomplete curriculum vitae will not be entertained. Shortlisting and selection shall be on open merit-based only. Last Date For Apply: April 14, 2019.